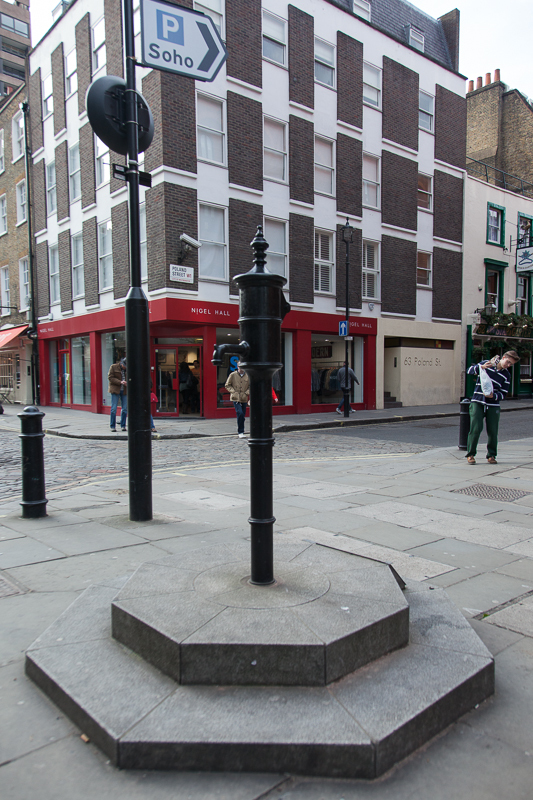 A grim reminder of the residents of Soho who died of cholera in the early 1800's. 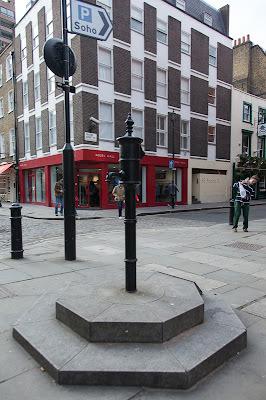 The replica pump was installed in 1992 in almost the same spot of the original water pump that John Snow proved was the cause of the epidemic. Soho in those days was a working market with cow sheds, a slaughter house and grease-boiling dens, with all the associated waste flowing through the drains and under the cellar floors. Snow, an anaesthetist who lived in the area worked out that the water pump was the source of the disease killing everyone. What alerted him, was that none of the employees of the local brewery caught cholera. Their wage packet included free beer so they were the only group not drinking water. However the local vicar insisted it was god not water that was the cause of the 500 deaths. The frustrated Snow finally broke the handle off the pump rendering it useless. The outbreak ended. Quite the interesting read today! Haven't been here in about a week... good to be back and perusing your former posts this week! What an interesting post today. I'm glad that Snow dared to offend the vicar. Cool. Definitely a story to tell at school. Thanks! What a great story, Mo. John Snow is a personal hero! (A rock star in the world of public health/epidemiology). I've never got a good picture of that pump, always pass by at night. Love seeing it here.